Interested in Music At The Palazzo Mailings? Much of my work over the past year has been devoted to a new project, which has been very exciting for me, because it is something I’ve never done before. In 2009, I was commissioned to create a choral piece for our community chorus, The Bagaduce Chorale. I wrote the text and music for a composition I named River. In a nutshell, it’s a big rollicking piece for a large choir about saying “yes” to life, despite our chronic objections. 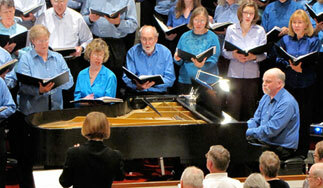 The Chorale and I premiered River here in Maine in spring of 2010. Trusting what’s in store as the river starts to roar. And whitecaps on the bay. ‘Don’t be afraid, Don’t be afraid.’ Trust the music. Never run out, never go dry, never fail you. Don’t look ahead. Don’t look behind. Don’t run away. Sing and they will hear. Sing! Never fight against the current. Follow the river, never stop. She will support you, soothe you and steer you through the night. Sung until my voice is almost gone. I thought that I would be in charge of my boat. I thought that I knew how to navigate and find my way back home. They’re not! They’re not! They’re NOT! Old River chuckles on her way. She smiles at all our fancy resumes. And simply washes all of them away. “Just trust and follow me! Just trust and follow me! And now I say “Yes! Yes! Yes!